Two major influences on the game have both resigned from our staff team since the last update. Brandon has left the development team. He plans to occasionally check in, but focus on other things. I wish my long time partner success, and stability. Ned has left the staff team too, for reasons beyond our reach. Ned has been one of our most dedicated staff for a long time, and I wish him the best. will be pushed out with increased consistency moving forward. I suppose this means we're accepting staff applications again, too. Finally, on a personal note - thank you all. It's still amazing to see the amount of support from the community. We're not going anywhere. Support for the "#" character when using ::setyellhex, which previously caused issues. Removed "Crawling hand" item drop from Crawling hand's drop table. Barrows no longer spams "You manage to continue your clue". Edibles; King Worm, Toad Legs, Bread. Added "Implemented" subsection to "approved" subsection in suggestions. Pickpocketing NPCs! With their proper loot tables. Stun system, implemented with thieving. 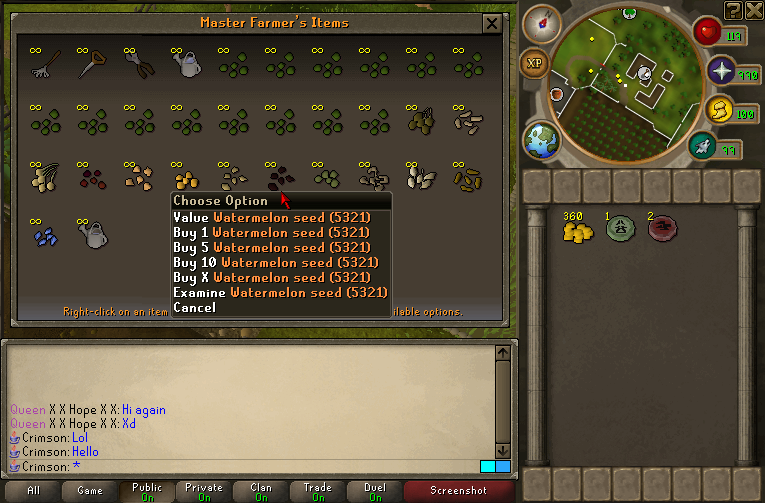 Watermelon seeds added to Farming skill shop for non-iron players. Improved PvP error logging to be more aggressive. Improved efficiency, and reduced redundancy of engine. Improved assigning of salts for hashing. Logging of players & gambling improved. Improved PlayerLoading for "old" character files.